A few days after my first steps into AR and how to use Microsoft's excellent HoloLens! I worked through several tutorials provided by Microsoft. I came to a point were a colleague of mine and myself created a small test scene. 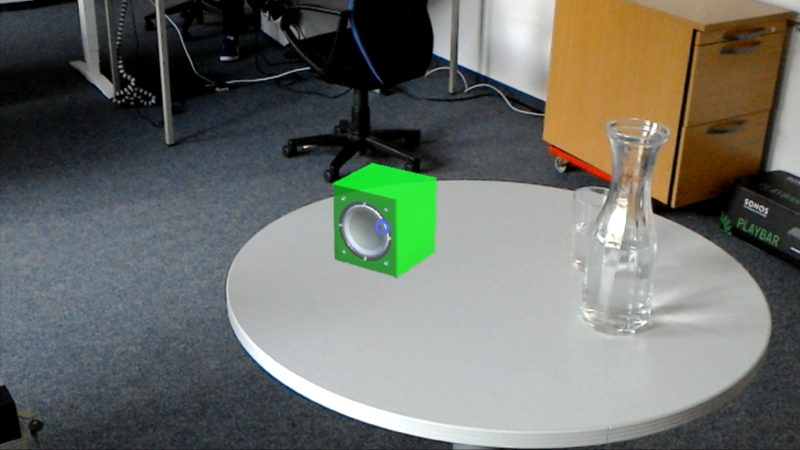 Our goal is to test the spatial sound of the HoloLens in several ways. Therefore, we placed a loudspeaker hologram into the room, emitting sound via the spatial sound engine. The loudspeaker can be moved by a tap and can be placed on all surfaces seen via spatial mapping. In addition, we can switch between songs and start and stop an audio clip by voice controls. Unfortunately the starting did not work as expected. As the video has been created by the end of the day I am excited to see what's coming up tomorrow. After a few days into developing for the HoloLens I noticed that it's fine to work with. Still there is room for improvements! The link between Unity and deployment via Visual Studio takes time. For our 65MB built it already takes 2-3 minutes to test. Enough time to work through the developer forums. Unfortunately, this is nothing easy to change as the HoloLens itself is a standalone piece of hardware. It is its own computer. In the developing process you simply deploy your software to the HoloLens via wireless LAN. So it is dependent from your switch/router. Tutorials seem to be partially deprecated, due to changes in the HoloLens source code. Some Tutorials, like the Holograms 210, do not work as intended. Missing documentation for using the HoloToolKit (a must-have asset, if you want to start fast with HoloLens developing). Check the GitHub-page: Click! I have no doubt Microsoft has great opportunities with AR here. Developer-wise they can still do more to nurture the content production process, though.